wargaming in 28 mm and sometimes smaller: A Cautionary Tale: The Green Cuirassiers! Perhaps the commissariat got confused with a dragoon regiment. May the making amends be quick & painless. Well despite the bit off color blindness :), they are still very nicely painted indeed! I forgot to add, a quick question, have these figures been 'dipped' or just 'washed'? Thanks, I suppose it will be not to big a deal to repaint the green, we will see tomorrow. Rob, I use the Darktone army painter applied with a brush and then quickly removed with another brush. You get an excellent result, I do not dip the figures and I find I always have problems with the surface tension with very thinned washes. Green coat and pink facings does sound like you were painting a dragoon regiment. Could you have had the plates for Kellermann's III Cavalry Corps out as you were painting? Still, they do look very nice! 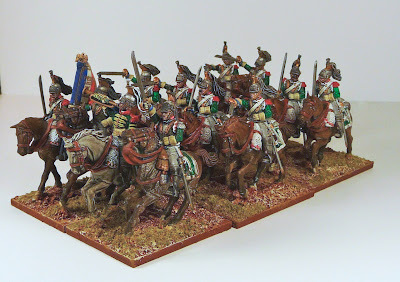 You need to be a little more canny, blame it on the cheap dye, the French used to use, obviously these chaps have been working hard on campaign and the dye had faded to an unusual shade of blue that looks remarkably similar to green!! 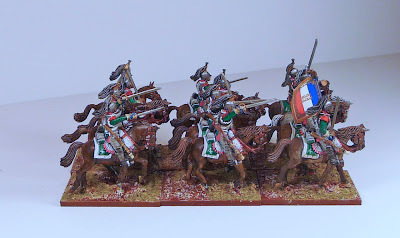 Did the Italian army in the Napoleonic army not have any green cuirassiers? I have no idea if they did but at least you could save repainting them? 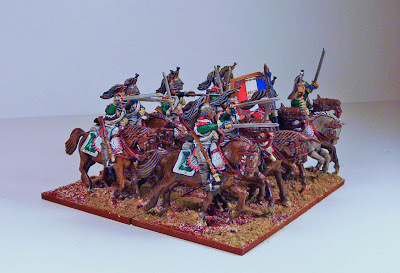 That's a real shame because they look great - in fact if you had tried to pass them off as Dragoons I bet none of us would have been the wiser! Thanks again, well it was pretty simple to do the wardrobe change, I will post the results tomorrow. 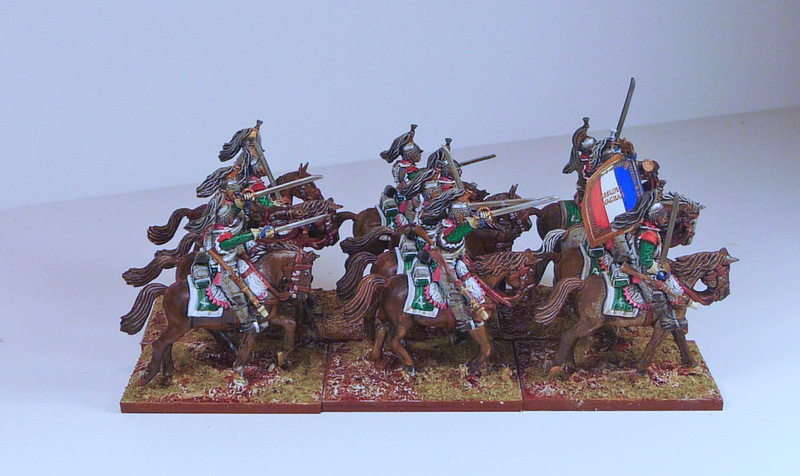 I did consider making them Italian cuirassiers, but their metal work was very shiny indeed.